↑ "Club Directory". 英超手冊2010/2011 (Premier League Handbook Season 2010/11) (PDF). Premier League. 2010. 第 35頁. （原先內容 (PDF)喺2010年12月14號歸檔）. 喺2010年8月17號搵到. ↑ "Anfield". Liverpool F.C. 喺2017年6月11號搵到. ↑ "Liverpool unveil new stadium". BBC Sport. 2002年5月17號. 喺2007年3月17號搵到. ↑ Hornby, Mike (2004年7月31號). "Reds stadium gets go-ahead". Liverpool Echo. 喺2006年9月12號搵到. ↑ "Liverpool get go-ahead on stadium". 英國廣播公司體育部. 2006年9月8號. 喺2007年3月8號搵到. ↑ "Liverpool's stadium move granted". 英國廣播公司. 2007年11月6號. 喺2010年8月12號搵到. ↑ "Liverpool stadium 'will be built'". 英國廣播公司體育部. 2009年9月17號. 喺2011年7月28號搵到. ↑ Smith, Ben (2012年10月15號). "Liverpool to redevelop Anfield instead of building on Stanley Park". BBC Sport. 英國廣播公司. 喺2014年8月16號搵到. 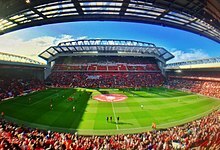 ↑ "Liverpool's new Main Stand boosts Anfield capacity to 54,000". 英國廣播公司. 2016年9月9號. 喺2017年6月11號搵到.